Listed below are some or our church ministries. The Congregational Care Ministry addresses the CRITICAL spiritual needs of the Grace Community Church congregation that are above and beyond those normally addressed by the Diaconate or other Ministries. This Ministry focuses on Compassionate Care and Spiritual Support to Grace Community Church members during critical situations. The Ladies Bible study will continue this month on Monday's at 9:30 with a special lesson by Michele Southerland on 1/21 and then prayer and fellowship on 1/28. Beginning 2/24/19 and continuing until 3/25/19 the group will be studying Wonderstruck by Margaret Feinberg. Michele Southerland will lead the group. Here is a link to a short video about the Bible study. Sign up in the church Resource Center or e-mail the church office at grace@phxcoxmail.com. The book cost is $15.00. Prayer Blankets: Given to members in time of need. Men’s Bible Study: Monday at 8AM - October 8 to December 18. A perfect place for men to fellowship and better understand what God has in store for all of us. Women’s Bible Study: See Women’s Ministry above. Betti Pflephsen has been a Christian since she was a teenager and has loved music all of her life. She and Dave raised three daughters and have five grandchildren. They have lived in Arizona for twenty-one years, and attended GCC for twelve years. 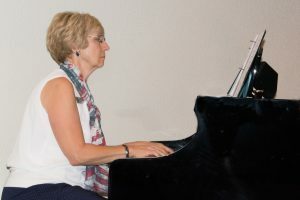 Betti has been the Choir Director for seven years and plays the organ and piano during worship service. Betti is amazing in her ability to share a story about many of the songs chosen for the choir to sing. She is appreciated for her gift of directing the choir and often blesses us with her amazing voice when she sings a solo. Betty Pflepsen leads the congregation in song. Michele Southerland,our Choir Director, lived in Oxnard, CA since the early 1960’s and moved to Arizona in 2015. She attended schools including Ventura and Oxnard College, studying music under the baton of Dr. E. Burns Taft. She has participated in or led a variety of worship services and community sing-a-longs. Michele directed and performed in the Penny Wolcott “Star Spangled” productions in Port Hueneme, CA. She directed children, youth and adult vocal and handbell choirs while Director of Traditional Worship at Westminster Presbyterian Church of Hueneme, and taught a comprehensive school-wide music program at a local elementary school. During the early 2000’s she participated in the Master Chorale of Ventura County providing leadership within her section. In 2011, the Pacific Shores Philharmonic Foundation. She performed with El Coro Maestro (Master Chorale) and was the board treasurer. Since retiring and moving to Arizona, Michele has performed with ProMusica AZ, Women in Song, in the 2016 West Valley Chorale production of the “Verdi Requiem” at Symphony Hall with Grand Canyon University, and rings with the Handbell Ringers of Sun City. Michele has been married to Eural, for 37 years and has two sons, Patrick, a luthier for Tom Anderson Guitarworks in Newbury Park, CA, and Michael, who currently drives for FedEx after a 8 year commitment with the USMC. Michelle Southerland our wonderful and talented Choir Director. Sherry Bennett our gifted pianist and organ player. We use a variety of activities to support and reach-out to our community. During the year we offer free concerts that are open to the community. We will be hosting a FREE concert featuring Legacy Quartet on February 24th at 10:00 a.m. The Legacy Quartet has performed all across America and was featured at the National Day of Prayer in Washington D.C.
Our Library has been created for the use of our congregation to expand their knowledge with the many Christian and Research books, as well as, audio and video resources. The Resource Center is also used for various displays and sign-up sheets for upcoming events.